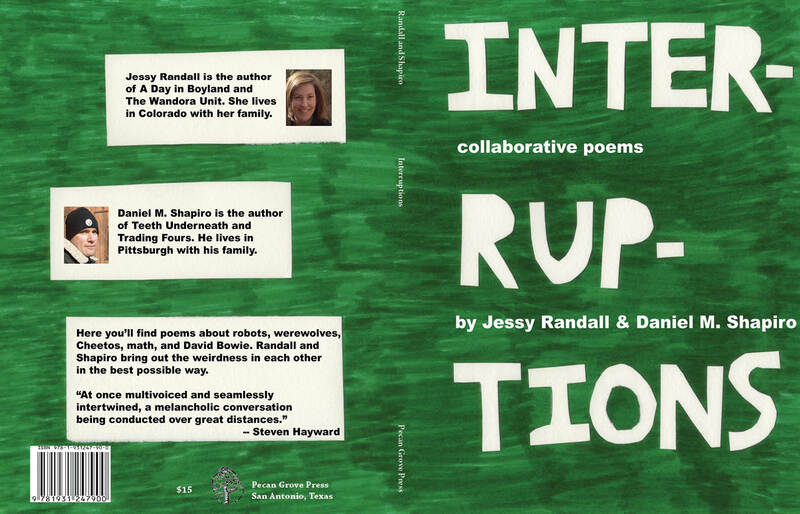 Jessy Randall's and Dan Shapiro's Interruptions Avra Wing's Recurring Dream"
This is a collection you must read to see these two minds at work. Everyday language turns into high absurdity with the turning of a page. Ionesco blends with "Dear Abby" and the cassettes of Krapp's Last Tape. This book, Interruptions,will have you laughing and maybe feeling very serious from page to page. If not, well, you've only invested $15, maybe enough for a couple of frappacinos. really quickly. I save time by running red lights and not brushing my teeth. I’m very good about that sort of thing. God, you need to chill, you know? Have some of my Cheetos. Do I have Cheetos breath? You can tell me. Hi, I’m a robot but I understand feelings. Would you like a snack? to give you a touch-free massage. At the beach. Clap again. I find that I have discovered an emotion, and it is love.